^ Northern Ireland has no official language. The use of English has been established through precedent. Irish and Ulster Scots are officially recognised by the British Government as minority languages. 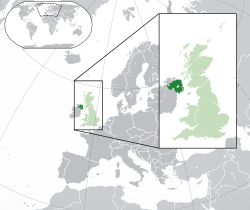 Northern Ireland (आयरिश: Tuaisceart Éireann [ˈt̪ˠuəʃcəɾˠt̪ˠ ˈeːɾʲən̪ˠ] ( listen); Ulster Scots: Norlin Airlann) is a constituent unit of the United Kingdom of Great Britain and Northern Ireland in the northeast of the island of Ireland. It is variously described as a country, province, region, or "part" of the United Kingdom, amongst other terms. Northern Ireland shares a border to the south and west with the Republic of Ireland. In 2011, its population was 1,810,863, constituting about 30% of the island's total population and about 3% of the UK's population. Established by the Northern Ireland Act 1998 as part of the Good Friday Agreement, the Northern Ireland Assembly holds responsibility for a range of devolved policy matters, while other areas are reserved for the British government. Northern Ireland co-operates with the Republic of Ireland in some areas, and the Agreement granted the Republic the ability to "put forward views and proposals" with "determined efforts to resolve disagreements between the two governments". ↑ "Northern Ireland Census 2011 Output". NISRAcensus/. 2011. पहुँचतिथी 2 November 2013. ↑ "The Countries of the UK". Office for National Statistics. Office for National Statistics (United Kingdom). पहुँचतिथी 7 July 2015. ↑ "Population Clock Northern Ireland (an assumption of population change after 30 जून 2014)". Northern Ireland Statistics and Research Agency (NISRA). पहुँचतिथी 4 दिसंबर 2015. ↑ 4.0 4.1 Northern Ireland Statistics & Research Agency (दिसंबर 2012). "Census 2011 Key Statistics for Northern Ireland" (PDF). पहुँचतिथी 14 जनवरी 2013. ↑ Eurostat. "Regional GDP - GDP per capita in the EU in 2013". ↑ Tuaisceart Éireann. DFA.ie. Retrieved 27 मार्च 2016. ↑ "Northern Ireland". Encyclopædia Britannica. पहुँचतिथी 11 अक्टूबर 2015. ↑ S. Dunn; H. Dawson (2000), An Alphabetical Listing of Word, Name and Place in Northern Ireland and the Living Language of Conflict, Lampeter: Edwin Mellen Press, One specific problem - in both general and particular senses - is to know what to call Northern Ireland itself: in the general sense, it is not a country, or a province, or a state - although some refer to it contemptuously as a statelet: the least controversial word appears to be jurisdiction, but this might change. ↑ J. Whyte; G. FitzGerald (1991), Interpreting Northern Ireland, Oxford: Oxford University Press, One problem must be adverted to in writing about Northern Ireland. This is the question of what name to give to the various geographical entities. These names can be controversial, with the choice often revealing one's political preferences. ... some refer to Northern Ireland as a 'province'. That usage can arouse irritation particularly among nationalists, who claim the title 'province' should be properly reserved to the four historic provinces of Ireland-Ulster, Leinster, Munster, and Connacht. If I want to a label to apply to Northern Ireland I shall call it a 'region'. Unionists should find that title as acceptable as 'province': Northern Ireland appears as a region in the regional statistics of the United Kingdom published by the British government. ↑ D. Murphy (1979), A Place Apart, London: Penguin Books, Next - what noun is appropriate to Northern Ireland? 'Province' won't do since one-third of the province is on the wrong side of the border. 'State' implies more self-determination than Northern Ireland has ever had and 'country' or 'nation' are blatantly absurd. 'Colony' has overtones that would be resented by both communities and 'statelet' sounds too patronizing, though outsiders might consider it more precise than anything else; so one is left with the unsatisfactory word 'region'.